Click the button below to add the Vandal Proof Black 700 TVL Metal Dome Kit (4 Cameras), 65' IR, Cables & Power Supply to your wish list. This camera kit includes four Vandal-proof CMOS outdoor security cameras with 65ft IR. Power Supply and 4/ea 60/ft cables are included. 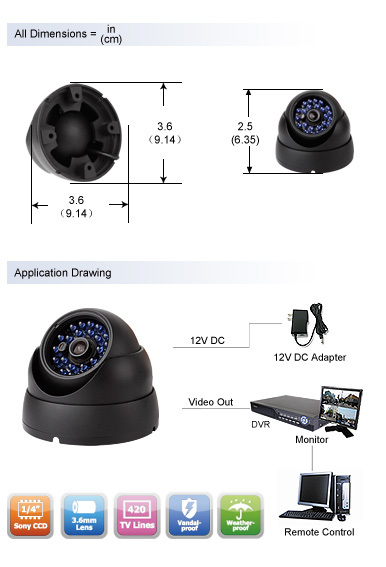 With 1/4" CMOS solid-state image device, the indoor/outdoor vandal-proof (Metal enclosure instead of plastic) color security camera provides a wonderful quality image day and night and has a very long life and high reliability. This vandal-proof camera can be installed outdoors or indoors almost wherever you want. It is both vandal-proof and weatherproof, which can work well under heavy force or rain. The color security camera provides a BNC connection for video and an RCA connection for power. It is easy to install and is plug-n- play. I am impressed with the quality of the camera I purchased as a replacement for an existing system for my church. It has a clearer resolution than the cameras I am using presently. and they are all 600 tvl cameras. It also is made much better with a metal housing instead of plastic.